I wanted something more tactile for wall art than a simple framed print, so I thought of making some felt art on canvas. 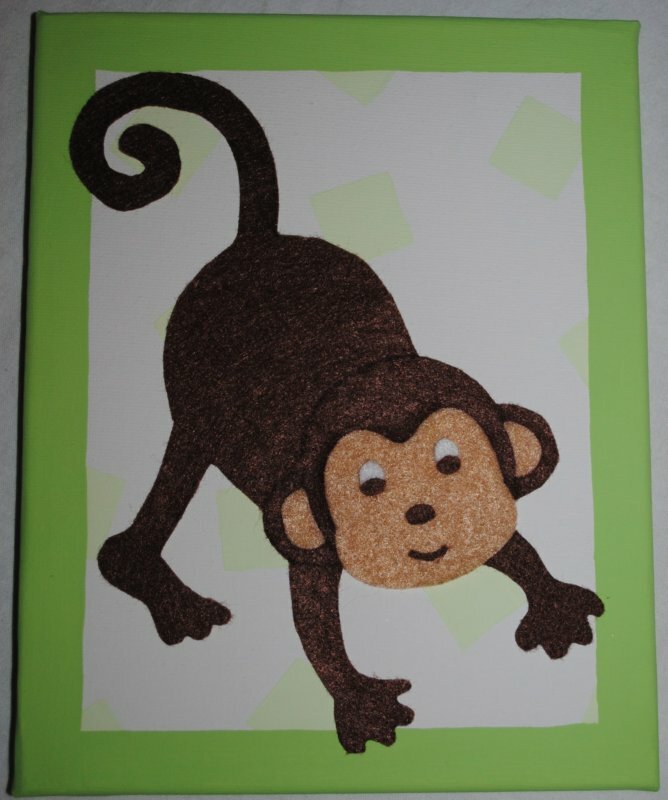 This is an inexpensive art project that you can do with simple animal pictures, flowers or even your own designs. I don't have pictures of every step since I did this one pre-blog, but you will get the idea! Step 1: Paint the canvas in whatever design you choose. I chose to paint a darker border around the full edge and sides of the canvas. I then lightened the paint and stenciled circles, squares and stars on 3 separate canvases. (Finished products pictured at bottom.) Allow to fully dry. Step 2: Cut out printed picture of choice. Make sure to cut out each colored section separately. This will make tracing and cutting easy. 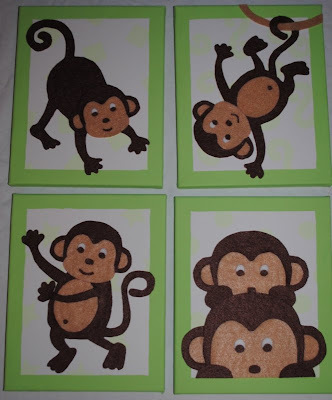 Trace each cutout on to the felt and cut out the felt pieces. Note: I cut out and inserted the lighter parts of the ears after cutting out the main body in brown. Step 3: Dry fit the pieces together and do any trimming that may be necessary prior to gluing on canvas. Once the parts are fit and trimmed lay them on the canvas to determine placement. Leaving it as still as possible you can start gluing down the arms and legs. This will anchor the body for gluing the rest. Glue the remaining parts and you are almost done. Step 4: Add eyes, nose and mouth ( I free-hand cut these.) Draw any lines that may be needed. I used a brown marker to distinguish the head from the back and to outline the ears. Now you have a cute wall hanging to adorn your baby's nursery (or other room if you desire.) I made 4 different canvases. Total cost of materials (not including common tools I had already) was $15. WHAT A DEAL! Everything can be found at Michael's or Joann. I used 50% off coupons on canvas 2-packs which made them about $2 per canvas. 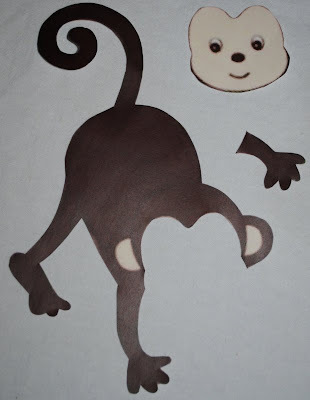 My homemade monkey wall art! I am new to the blogging world and am excited to share my adventures with you all (which is no one yet...) I guess the best place to start is the beginning of the journey that has brought me to motherhood. I met my husband, Jimmy, in the fall of 2007 after being set up on a blind date by a close friend. Who ever thought those things actually worked out?! 16 months and 9 days later we were married. 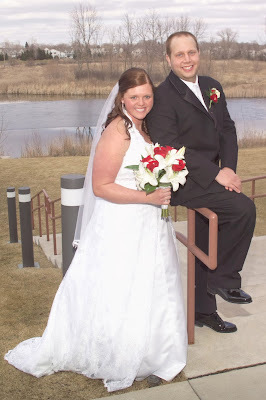 At 23 and 28 we had plenty of time to think about starting a family and decided to enjoy married life for a while. About a year and a half later we decided it might be time to start a family. One thing that you will learn about me is that I am a bit of a control freak and can be a perfectionist... Those two things don't really go well with trying to start a family. Of course, there are certain actions that will help you along in the process, but even if you do everything right it doesn't mean you will make that baby. After 4 months of trying I was getting a bit discouraged (which is silly since it takes the average woman 6 months!) so I stopped "really" trying. Yes, I stopped trying. I was really pushing the topic and it wasn't helping things. My first piece of advice to those looking to start a family is to take it slow and not too seriously for the first few months, it will make the experience much more enjoyable! Sure enough our month "off" ended in a positive test! We were so excited and a little nervous all at the same time. My pregnancy thus far has been very uneventful. I had no morning sickness and very few other symptoms. At 7 weeks we got to see our bean for the first time. I never thought watching a heart beat 144 times per minute on a fuzzy black and white screen would bring me to tears (Jimmy too!) 13 long weeks later (last Thursday) we had our anatomy and gender scan! Everything measured well and HE looks very healthy. 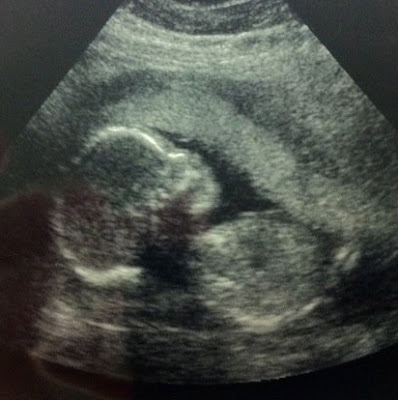 We are very excited to welcome our little left fielder (Jimmy's words) around December 6th. That leads us to today (21 weeks down, 19 to go!) I am a crafty mommy-to-be that is also on a budget! I hope to share with you my experiences with pregnancy and some of the fun crafty things I am doing along the way. Nearly all of the decorations and accessories in my nursery are going to be handmade (including the bedding!) I hope you enjoy this journey with me as my baby (and belly) continue to grow!